The Weymouth and Portland National Sailing Academy was the ultimate venue last week for lucky Jaffa Citrus school competition winners. The competition promoted through Tesco Community Champions provided outstanding sports students at five schools with a water sports day treat run on site the 2012 Olympic sailing venue in association with SailLaser and OTC. The competition involved students reporting on the impact of the London Olympics upon sport at their school with the inclusion of photographs. The water sports prize involved the opportunity to try dinghy sailing, windsurfing and stand up paddle boarding. Also staying in the same accommodation at the Royal Yachting Association’s Portland House, where the likes of Sir Ben Ainslie stayed for training and racing, the prize winners were fully immersed in the Olympic sailing set up from 2012. A number of the young water sport enthusiasts surprised themselves with their natural aptitude for specific disciplines. 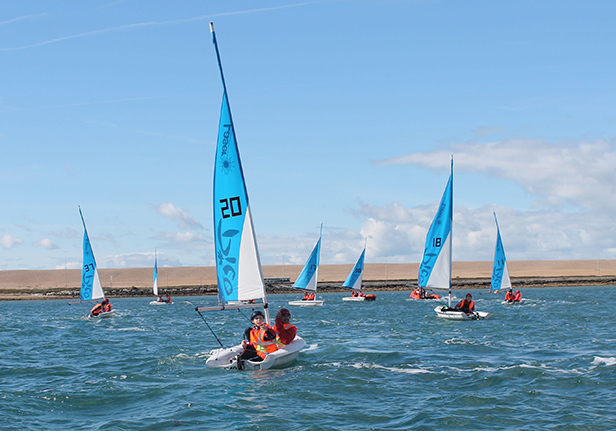 Josh Porter, Year 10 at Lyndon School, had a very memorable experience at the Weymouth and Portland National Sailing Academy, “It was amazing, I am very glad I had the chance to go to the WPNSA, everyone had a brilliant time. We had perfect weather, the instructors taught us the basics of how to sail and windsurf and then we picked the rest up quite quickly by ourselves”. Kitted out with wetsuits the prize winners were happy to fall in the waters of sheltered Portland Harbour. Peter Allam, Chief Executive of WPNSA, “Jaffa Citrus is an important competition that has inspired yet more young, enthusiastic school children to take up water sports from the UK’s leading venue. The whole group thoroughly enjoyed themselves and we look forward to inviting them back to the Academy to further their training”.